I know I always start these things with saying how excited, but seriously, how can I not be. Iconic, epic, thrilling It’s THE BIG PIT time. My first time here! (yeah wtf have I been doing?) All those photos, especially last year, are so cool and I was soooooo jealous there was no question about going this year. I had to double check the rendezvous with the guys because (a) the clocks changed overnight and (b) the difference in the English/Dutch way of saying the time – 0830 is half 8 in English, but half 9 in Dutch – but I was up at the crack of dawn anyway, like a kid at christmas. As a bonus, the guys had already got a ticket for me and then managed to blag their way into the VIP parking area (I love these guys). On entering the course, the guys played it cool for a bit and we went wandering through the mobile homes and hit the beer tent for coffee. But before long, i couldn’t contain myself and has to go the De Kuil. it was everything I expected from all those photos. In the mean time, the young guys (where are the girls?) were already off for the start of the days’ races. 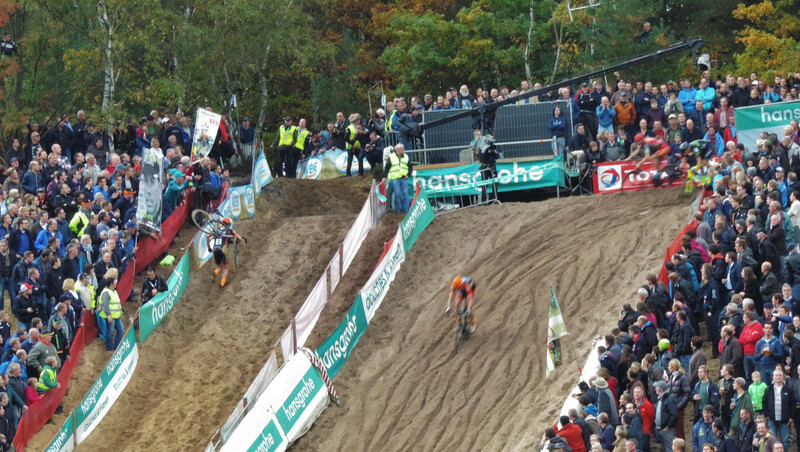 Jens Dekker leads as Jappe Jaspers drops in. © 2015 Cat Armour. 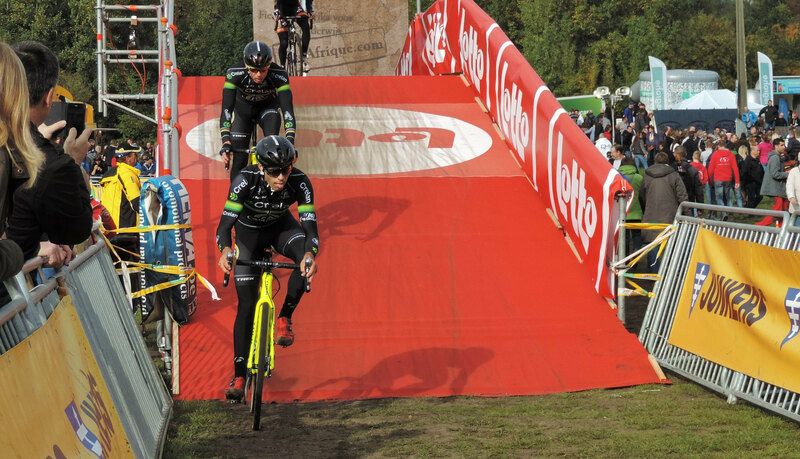 This time it was Jens Dekker’s turn to win from Jappe Jaspers, but despite much encouragement from the crowd, Seppe Rombouts couldn’t get that 3rd spot today and it was an Enertherm-BKCP team clean sweep with Victor Vandebosch getting up there. The guys went off to the beer tent and the caravans while I was at the podium and I never did get round there so unfortuntely, no bike pr0n today. On the plus side I did get frites! There is more to this course than THE PIT (my mind always wants to capitalise) and just in case you thought that was sand a-plenty, you were very wrong. 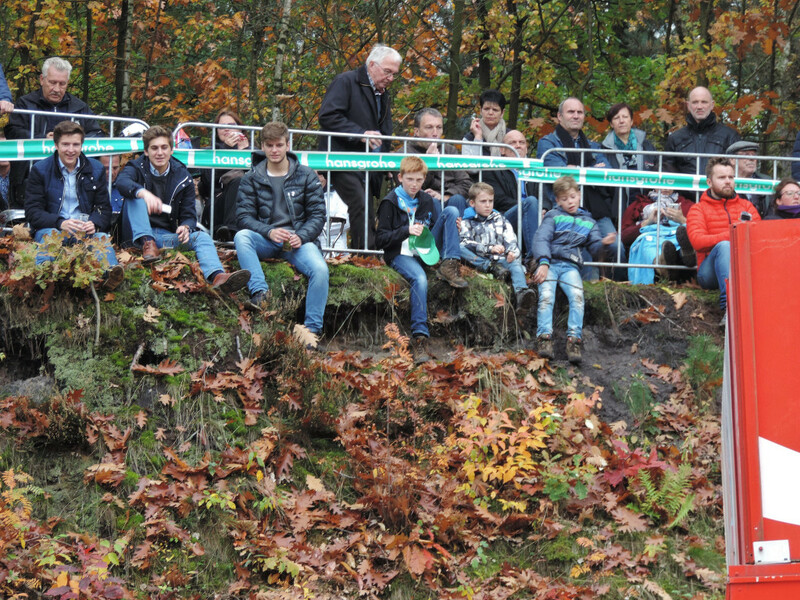 As the pics from the U23 race show there’s a particular tricky bit at the top of the course where many came a cropper. Dear David Montgomery, don’t be too upset about my capturing your mishap, at least you are claimed as Belgian in the official programme, that’s how highly they think of you. They attempted to claim Mathieu van der Poel last year. Just a few short weeks ago Eli Iserbuyt was chuffed just to be on the podium after stepping up to U23, but now he is proving himself the guy to beat. It has to be noted though that the only person with legs whiter than Eli is me. Is Iserbuyt the Flemish equivalent of McNamara? And YAY! I got the GPON in early! 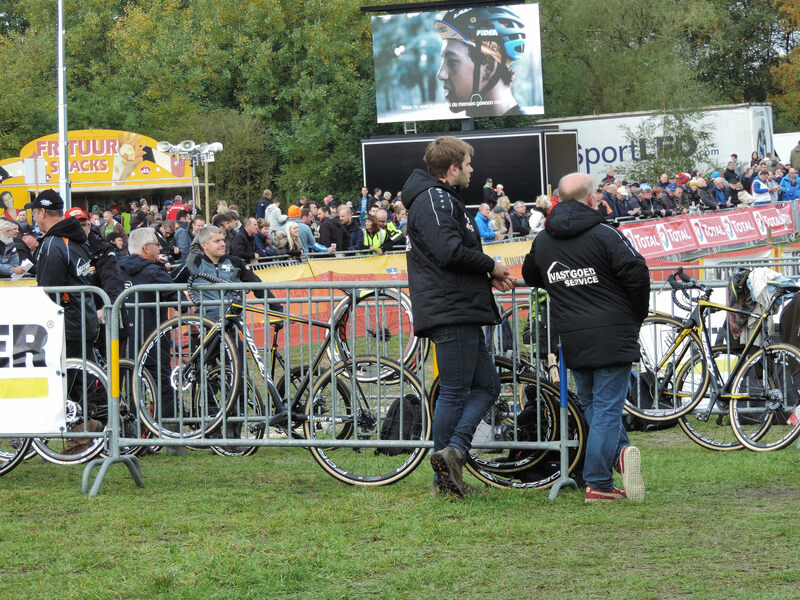 So much has already been written about the decision to partner Superprestige with TelenetPlay. 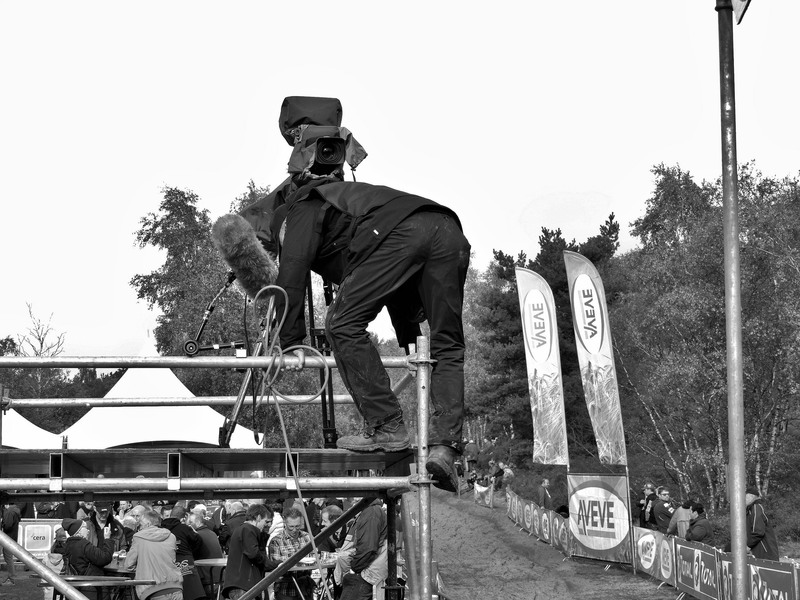 So many mixed feelings as I saw the guy climb up to his camera before the start of the Women’s Race, or Ladies Cup as they’re calling it. 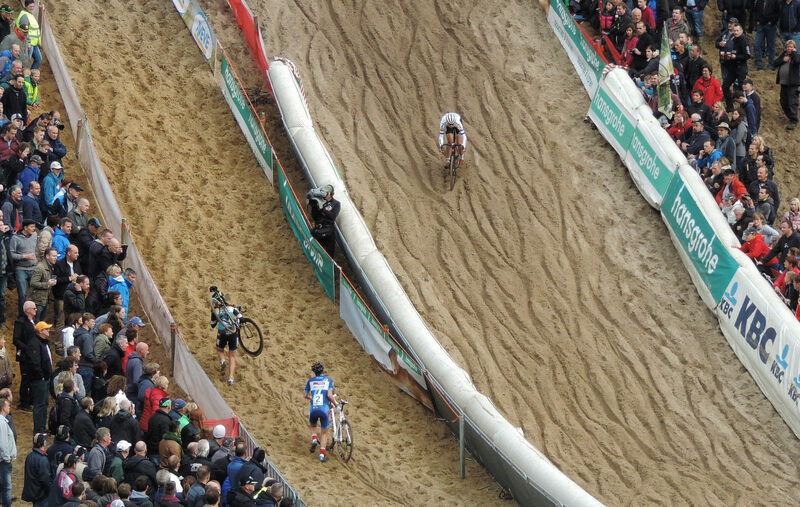 Firstly, YAY actual live pictures of a women’s race. Secondly, who is going to be able to see it? 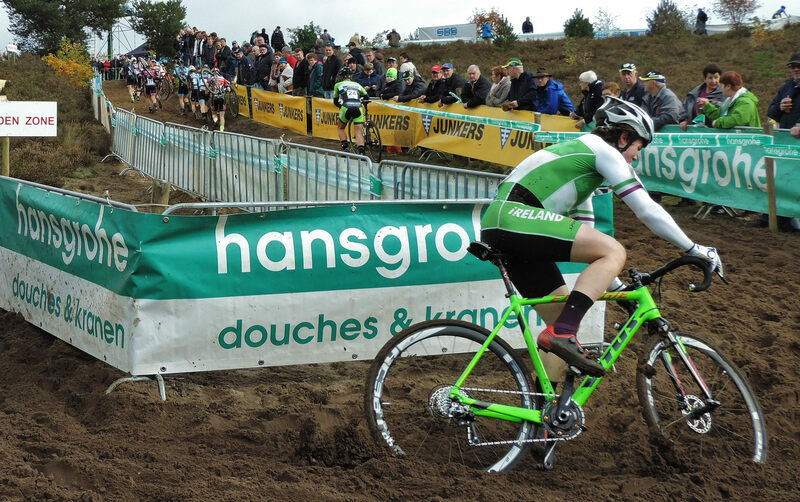 For those of us searching out potential international sponsors for women’s cyclocross the pool may have just got smaller as few outside of Belgium can now see these races. 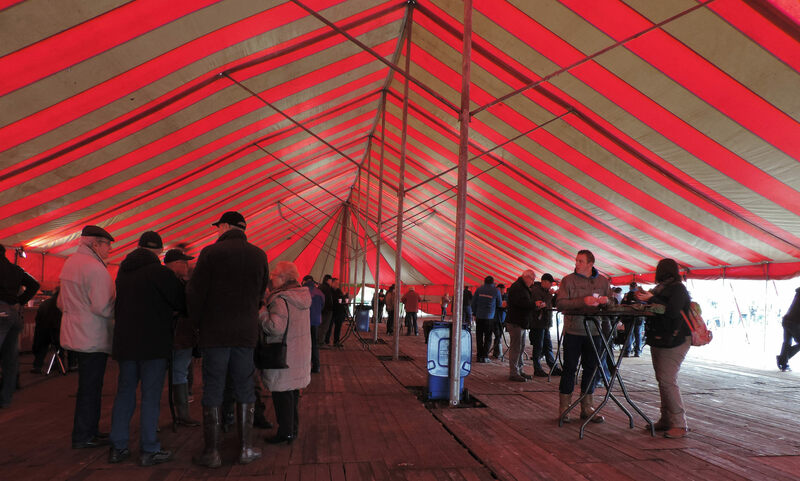 However, there may be a knock on effect in that more may come to the races instead of watching on TV. We shall have to see. Straight off the line Nikki Harris put her foot down. Always thereabouts she has shown some cracking form so far this season. Sanne van Paassen, has also been going some, but the one to beat so far this year is Belgian Champion and European Champion, Sanne Cant. 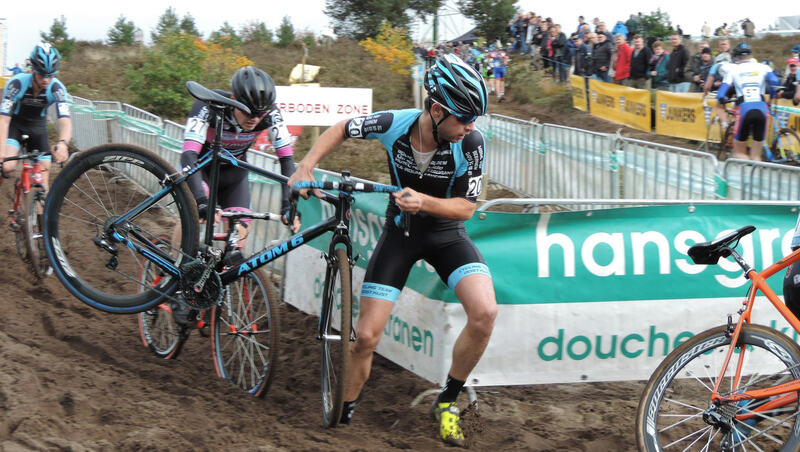 Surprisingly decked out in the EK blue kit she is the darling of the Belgian CX racegoers. 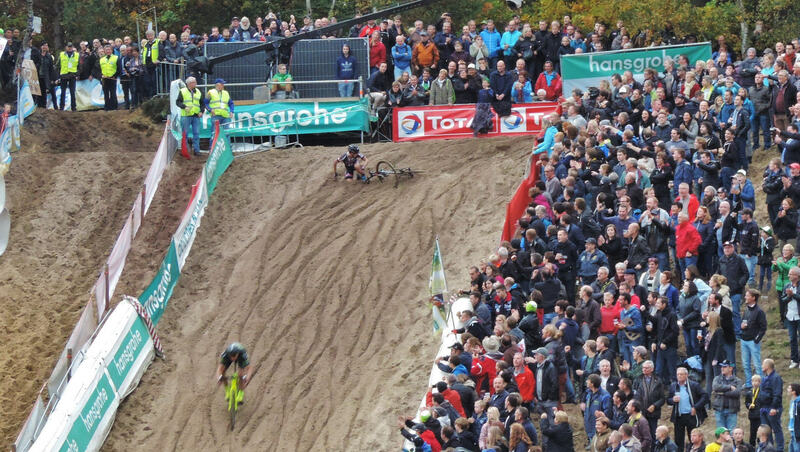 The #SanneShout may not be quite as loud as the #SVENNOISE but in the bowl at Zonhoven it is great to hear. It was Sanne Cant and Nikki Harris that pulled away at the front leaving Sanne van Paassen, Jolien Verschueren and Helen Wyman to sort out the minor placings. Apparently Nikki had a tumble, but I didn’t see that, but I did see Sanne hit the deck cming into De Kuil, which made for a tight, head-to-head race to the finish with Nikki. Unfortunately, the TV people stuffed up again and instead of this battle we got to see the commentators head as he waited to go to camera. We all agreed his hair looked lovely, but we’d rather see the end of the race! Thank you to the announcer we heard it and got to cheer, but oh, what a f**k up! Sorry for no Women’s podium pics, but I couldn’t get from pit to podium and have a pee and meet the guys in the time. Thankfully, it was beer o’clock though and I’m back at the bottom of the pit by the big screen waiting for the Men’s Race. Hey, it’s not just me that gets super-excited about these things you know! 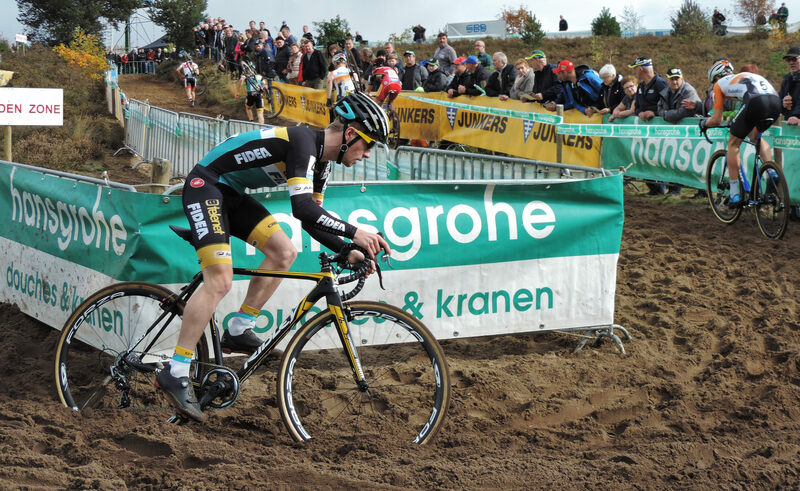 We love to see Gianni Vermeersch first into De Kuil and this years strongest contenders are not far behind. Next to Sven. the biggest cheers go to the back marker who today is (I think!) Etienne Sleidhy, in the absense of the Kiwi’s and chaps with huge amounts of facial hair. Lap after lap the race unfolded with Lars and Sven having a go, but when Wout decides its time to go, he goes. He chose that little sandy hill that the young ‘uns had so much trouble with and there was no catching him, certainly not with Rob Peeters policing the chasers either. My Twitter followers will know how much disdain I felt for the woman who cheered and jumped up and down at the demise of Klaas. Good to know I was not the only one who looked on her behaviour with disgust. 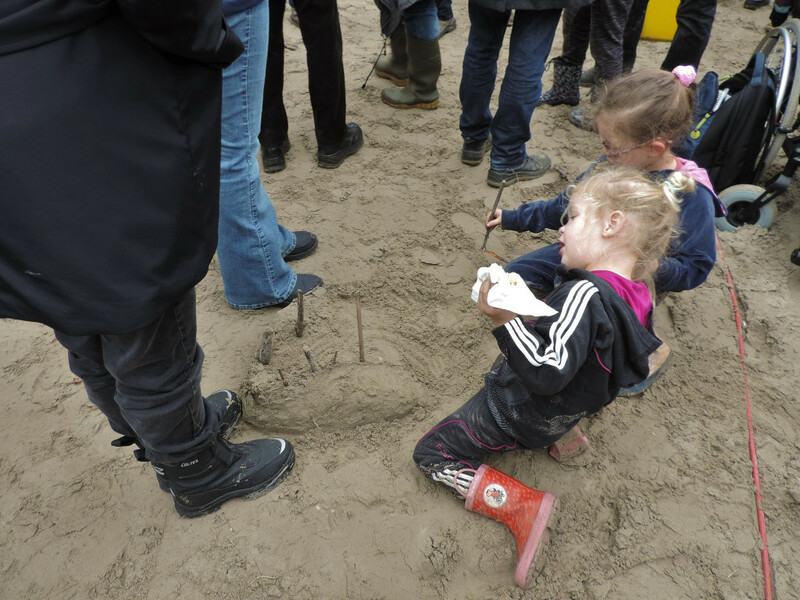 In the meantime, the kids by my feet had got a good sandcastle coming along nicely. So with the women as the men, we watch for the minor placings and this battle was gripping. 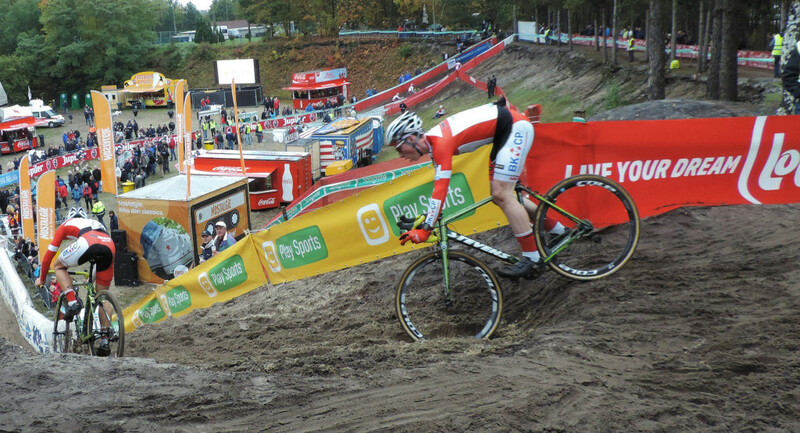 Sven got the crowd roaring as he overtook Kevin on the inside by riding the hill instead of running and then Lars makes the big mistake of tumbling in the same place Sanne Cant did about an hour earlier. he gets up quick but not quick enough and Kevin goes flying past. Rob Peeters still holding on to the 2nd spot with Sven and Kevin coming back to him with every pedal stroke. 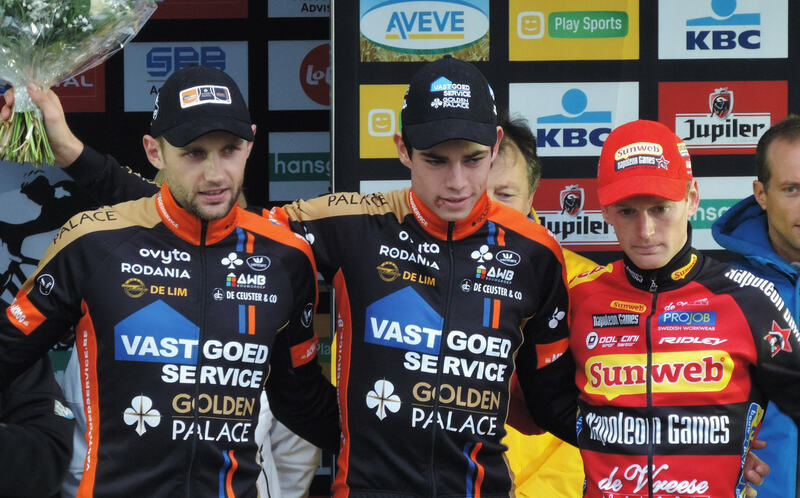 We see Sven slow and Kevin takes a flyer around him and nearly makes it past Rob on the line, but he settles for a well won 3rd place and great to see Rob Peeters on the podium. I’m told it is weird for the racers to be going past when everyone is watching the big screen and not them, but thats what we do. Pay money to come to an event and watch the TV! Ha, ha I love this sport. A quick drink is called for to use up the tokens we bought and then we head off. Today’s history of Belgian Cycling lesson comes in the form of a visit to a new bar/B&B/restaurant and cycling haven in Veerle-Laakdal called Surplace courtesy of Chris van Roosbroek, whose father is Staf van Roosbroek (Google is your friend). The restaurant was lovely and there are some nice cycling memorabilia items dotted around. What a great day. 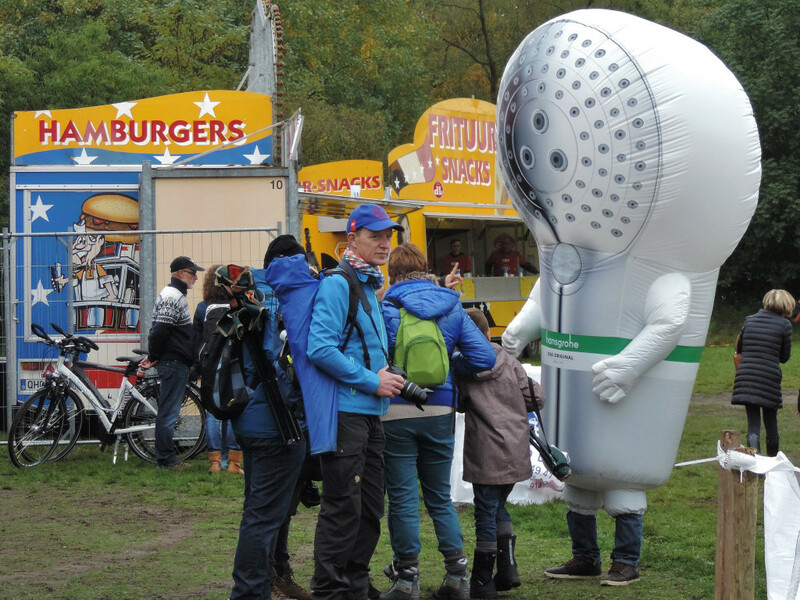 Thank you Hansgrohe, despite the dodgy naked people posters, for your continues support. Let’s get this TV problem sorted. 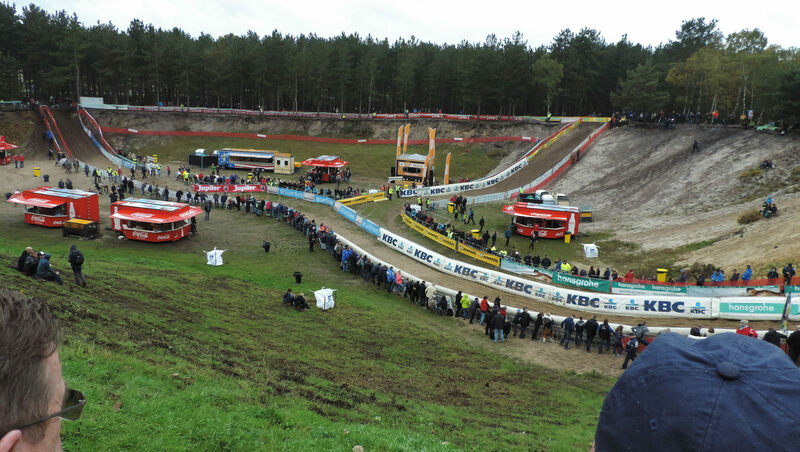 Next week, Oh Boy, KOPPENBERGCROSS.